It knits to reveal a Fair Isle style design, thanks to the colourful mix of creams pinks, oranges and browns, making simple knits look more detailed. It knits to reveal a Fair Isle style design, thanks to the colourful mix of creams pinks, oranges and browns, making simple knits look more detailed. 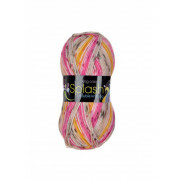 A double knit yarn, with a fun splash of colour, from King Cole. Perfect for ladies and children’s knits.